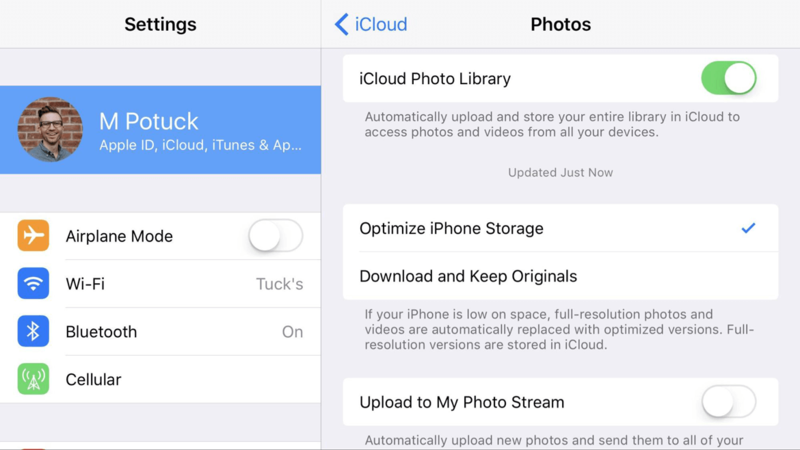 Today I want to tell you about details on iCloud Photos which could be confusing for you. This article is a perfect choice for those people who want to know everything about Photos for iCloud and manage their images and videos like a ninja. There are several ways how Apple integrates their service with the Photos app in MacOS and iOS. The most wide-known is the iCloud Photo library. Others are My Photo stream and iCloud Photo sharing. I'll tell you about each one step-by-step, so you'll be able to choose the most comfortable method and use it every time you need to share an image. Automatic synchronization of photos and videos across all the devices is the main benefit of the iCloud library. Another great benefit is compressing your files so they take not much space on your iPhones, iPads and Macs. You may also choose where to store your files, on one of devices or in your iCloud. In case you want to have a constant access to all the files including edits from all your Apple devices, iCloud Photo library will be an ideal option for you. Bear in mind that files will require more free space of the iCloud storage, so it's likely you'll need to upgrade to another tariff plan. For example, you can use a 50Gb plan that costs $0.99 per one month. It is not expensive and may be comfortable. Use the device that stores the most of your photos. If you use Mac for storing them, find a manual below. Tap 'Settings' and ensure that you are connected to Wi-Fi. Choose you name at the screen top and go to iCloud. In iOS 10.3 and later, iCloud can be found below 'General'. Turn on the toggle near the 'iCloud Photo library' line, if it is not activated yet. - Download and keep originals. And here is a manual for MacOS users. Connect your Mac to Wi-Fi. Open the Photos app and choose 'Photos' in the upper left corner. 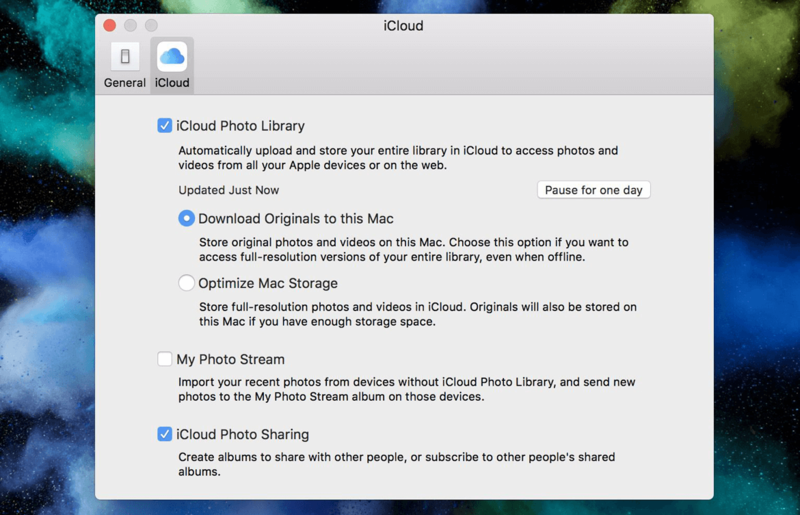 Turn on the 'iCloud Photo library' in the check box. - Download originals to this Mac. The feature called My Photo stream works with iCloud and pushes some amount of images to your devices. This option is not available in the latest system versions, but it is still available on MacOS 10.12 and iOS 10.3. I can say that it has its limits, but there are some advantages too. It works separately from the iCloud storage. It can upload up to one thousand images for the last 30 days. This feature downloads pictures to mobile devices in a smaller resolution in order not to eat much disk space. It also downloads them to Mac in full-resolution. Your edits won't be visible on all the devices. For me, the main plus of this Photo stream is that it doesn't take the iCloud storage. At the same time, I can say that pushing up to 1K images and not synchronizing edits are some sort of disadvantages. This feature allows you to create shared albums and subscribe to others' albums. This reminds me of a 'private Instagram'. For commenting photos and videos, an album owner must accept you. To try it, find the tab named 'Shared' at the Photos app bottom on an iPhone or iPad. There is a cloud symbol on it. If you use a Macm find 'Shared' albums on the left side bar. Choose your name (or 'iCloud', if you use iOS 10.3 or older). Go to 'iCloud' and to 'Photos'. Turn on the toggle near the 'iCloud Photo sharing' line. Once you do it, it should become green. Go to the 'iCloud' tab. Turn on the Photo sharing feature. If people you want to share photos with don't use Apple devices, there is also a way to show them your pics. So, calm down, you won't need to switch your favorite iPhone to another device. Google Photos is an easy and handy solution. You can download it from the App Store free of charge. The storage is unlimited, so you can upload as many images as you need. 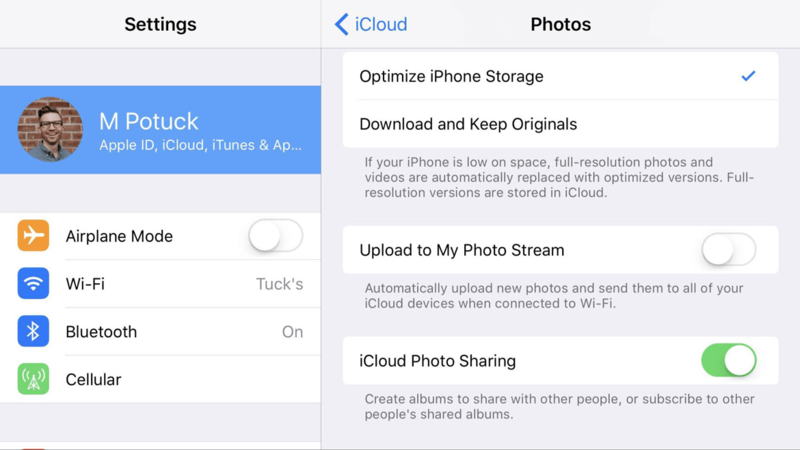 You can use both iCloud Photo library and Google Photos at one time. Accessing your images from the web and any device is also possible. In case you have been using the Photo library, visit icloud.com and go to Photos. There, you can download your pictures to a Mac or a PC. After that, you may connect it with an Android device and sync the images. I hope I haven’t forgotten anything. But if there is something left behind, please share your thoughts in comments. And don’t forget to subscribe to my newsletter to learn more tips and tricks.